Providing the guidance and support you need. From faculty that includes multiple New York Times bestselling authors to nationally recognized agents, editors, publishers, and publicists, this conference offers writers of all levels the opportunity to learn more about the art, craft, and business of writing in one of the most intimate settings possible. 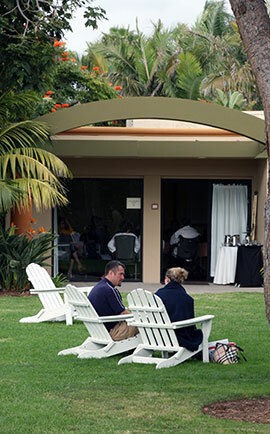 Dedicated to fostering great relationships, the La Jolla Writer’s Conference has welcomed attendees from more than 35 states and 5 countries, offering a student faculty ratio of 5 to 1, with a maximum of 200 attendees. With class sizes averaging less than 25 people, the LJWC is designed to be a completely non-commercial environment. Dedicated to helping every writer maximize their potential, our faculty prides itself in leaving no questions unanswered. The LJWC promises to be an invaluable experience for any writer. Whether you are a casual writer looking to improve your craft, a practiced author looking for an agent, or a businessperson seeking writing and publishing knowledge, the LJWC is here to provide the guidance and support you need. Antoinette is the Founder of the La Jolla Writer’s Conference. Late in the year of 2000, a colleague mentioned he was depressed because there wouldn’t be another writer’s conference in the San Diego area for another year. With an incredible background and considerable contacts in the writing industry, Antoinette decided to create the LJWC that very week. With a small group of volunteer advisors, a handful of people launched the inaugural LJWC less than 10 months later in October of 2001. Award-winning author of the book-turned-movie PAY IT FORWARD Catherine Ryan Hyde, agreed to be the first keynote speaker. As misfortune would have it, the LJWC launched one month after 9/11. Understandably, many of the registered attendees withdrew, preferring not to travel, cutting the attendance by more than two-thirds. Antoinette and her advisors decided that if even a single person was willing to attend, the LJWC would go on. With Catherine’s permission, the conference adopted “Pay it Forward” as its theme and from day one, not a single faculty member, staff member, or keynote speaker has received payment to teach at the conference. From the agents to the New York Times bestselling keynote speakers to the staff that coordinates the conference, everyone volunteers their time. Jared joined the La Jolla Writer’s Conference in its second year. Since then he has absorbed the duties of directing the entire conference from planning the classes and schedule to choosing the venue. Together, Jared and Antoinette enjoy bringing the LJWC to the world-wide writing community. Register for the 2017 La Jolla Writer’s Conference!